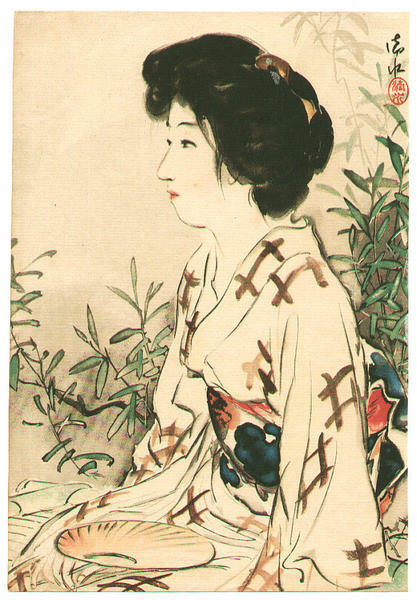 [Go Back] [New Search] Details for Shinsui Ito (1898-1972) "Lady in Summer"
Condition good … paper toning, slightly soiled. (1) a foxing on her cheek. (2) Two horizontal kuchi-e folds, a foxing on the upper left background, lower right area soiled. Description Lithograph kuchi-e made in Taisho era (1912-1925). (1) Lady in Summer. Size: 180 x 255mm. (2) Living Room. Size: 260 x 330mm.